I wore this blue mod look for a Saturday spent wandering Brooklyn Flea and an evening of grilling in Jason's backyard. This "shirt" is actually a dress. Admittedly, it got a bit tight in the midsection, but I threw a skirt on top and was good to go. Obviously I love food and it's catching up to me lately. Jason and I started the series Ballet Beautiful to try and get into shape. I used to do ballet as a kid and Jason likes it because the woman instructs in a calm, soothing manner (none of that "Doitdoitdoit!" stuff). Since starting an office job last year, my natural exercise has dwindled. Thankfully I live in New York where going up and down a million stairs is just part of my day. I love this happy blurry picture. Shoes: G.H. Bass and Co.
Gah you look sooo cute!! I love this look on you. 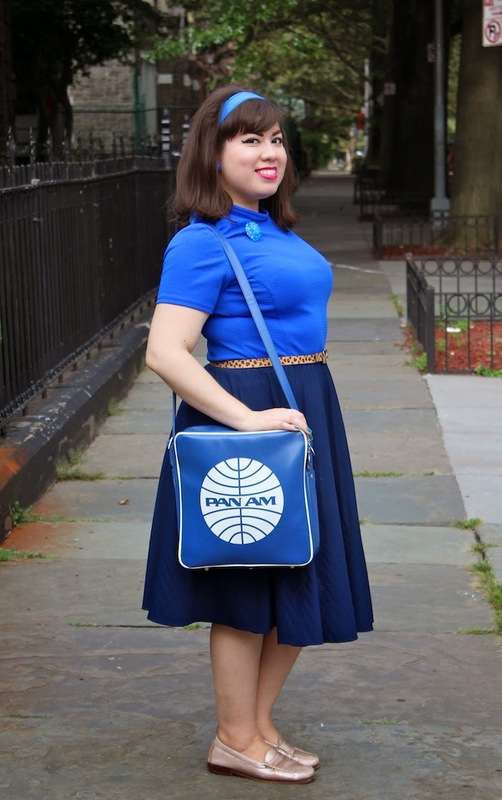 I've also lusted over those PanAm bags for such a long time. Is this one big enough to carry a DSLR, do you think? I'm trying to find a good purse that will accommodate my camera for my NY trip! Thanks!! I love this bag so much. I got it when I worked at a thrift store. It's Marc Jacobs but it's exactly like most of the Pan Am bags I see. It's big enough to hold my camera and everything else I need and it's waterproof so I always use it when it rains. Hi Kristina! Your outfit looks very sweet. 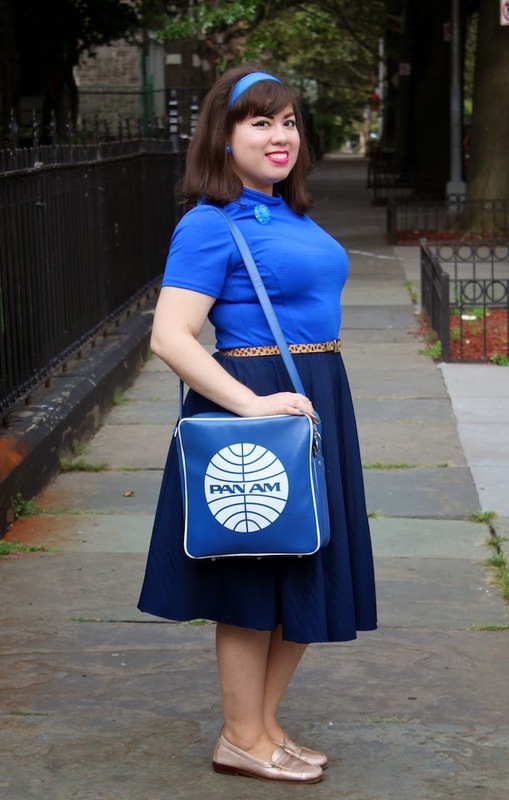 I love the Pan Am bag. The circle skirt is darling and the ballet for exercise sounds fun! This is totally adorable. I love your sassy 60s stewardess look, beyond fabulous. I need to experiment more with wearing dresses as tops. I've seen people recommend it before, but it's never something that I remember when I'm getting dressed in the morning. I could see it really helping with keeping your top tucked in, at the very least. I love this outfit! I do the same thing if a dress is tighter in the tummy area I just put a shirt over it and it's good to go! I found you in Juicy Peaches :) and um, I am in love! 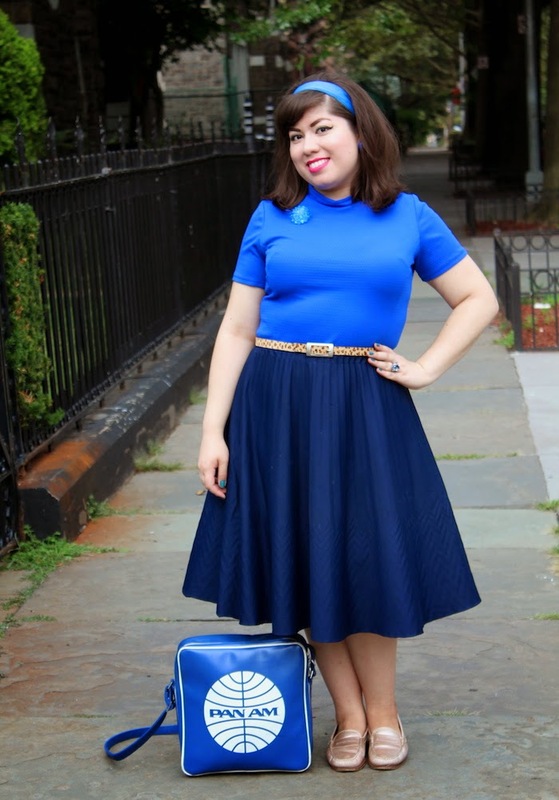 This blue is stunning on you and I love the retro vibe of your entire blog. Smitten! Aww that makes me really happy! I literally just swapped banner with those gals. They are the cutest. This whole outfit is just too adorable! I really love the different shades of blue and your hair :). Such an adorable look. Loving all the blue!